Dugway and Skull Valley are off to the right (east). Ibapah is on the left. The red line is the early 1913 route around the far south end of the salt flats with J J. Thomas Ranch (Fish Springs) on the very bottom. The road then continues west to Callao and northwest through Overland Canyon to Ibapah. Overland Canyon was the route of the Overland Stage and the Pony Express. 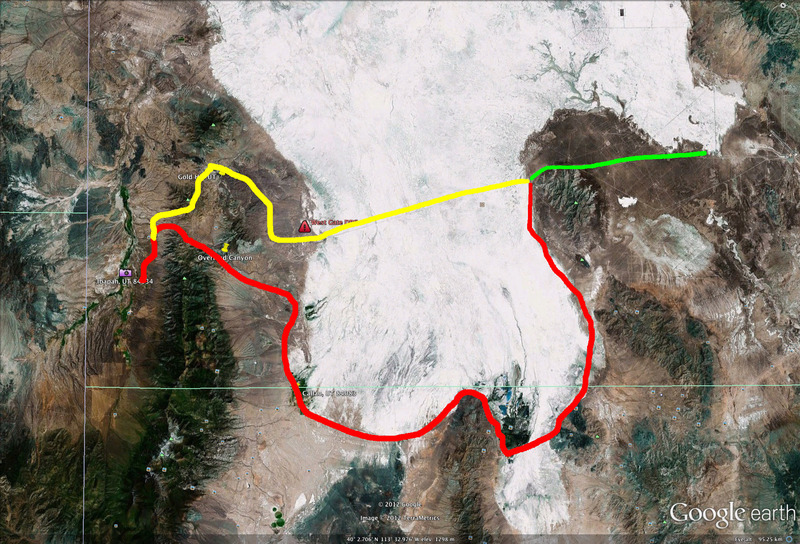 The yellow line shows the 1919 the Lincoln Highway Association plan to cross the desert on a causeway, saving miles by bypassing Fish Springs and Callao and traveling instead through Gold Hill and then down to Ibapah. It was known as the Goodyear Cutoff since much of the financing came from Goodyear, the tire company. The entire project soon became embroiled in politics and money (Wait! Politics and money are always tied together) and as a result only half of the causeway was completed and graded with rock. There are numerous accounts of the whole messy business elsewhere online and I invite you to do a search. The Goodyear Cutoff was the route of the 1919 Army convoy which included Dwight Eisenhower and, because it was not finished properly, the participants became stuck in the mud of the salt flats. Today the road is part of the Dugway Proving Grounds and is off limits. This entry was posted in Callao, Desert, Dugway, Gold Hill, Goodyear Cutoff, Lincoln Highway, Salt Lake Desert, Skull Valley, Utah. Bookmark the permalink.